Last week I met with Dave Humphrey and Jon Buckley to discuss creating a game for the HTML5 games week which will take place at Mozilla’s Toronto office in mid-February. The main purpose of this is to drive the development and showcase the Gladius game engine. At the end of the meeting we decided it would make the most sense to upgrade the No Comply demo by adding interaction—making a small game. Since we only have a few weeks, we decided to keep it simple. Keeping that in mind I created a game specification. After putting together the spec, I started on a prototype. I began the prototype by playing and analyzing the game mechanics of Mortal Kombat I. The game is simple enough to emulate given the time frame. I took some notes and concluded characters always appear to be in discrete states. If characters are in a particular state, they may or may not be able to transition into another state. Initially a player is idle. From there, they can transition into a jumping. Once jumping they cannot block, but are allowed to punch an kick. Having understood the basic rules, I drew a diagram to visually represent some states. The diagram led me to believe I could use the state pattern to keep the game extensible. We can get a basic game working and the design should lend itself to later (painless) modification. Having worked with Processing for some time I knew it would be an ideal tool to construct a prototype of the game. Processing enables developers to get graphical interactive software up and running quickly and easily. The structure is elegant and the language inherits Java’s simple object-oriented syntax. 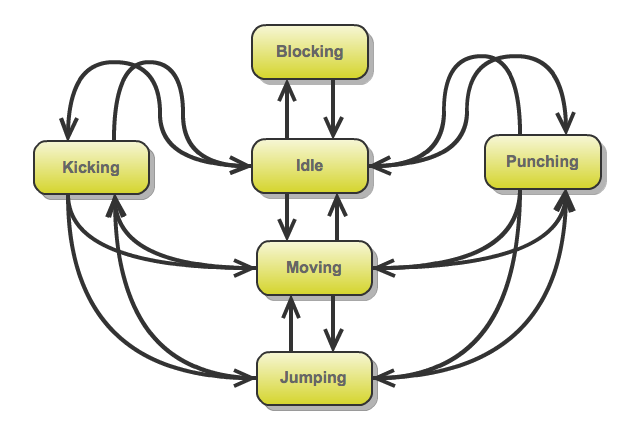 I began creating a Processing sketch by adding the necessary classes for player states such as moving, jumping and punching. I hooked in keyboard input to allow changing states and rendered text to indicate the current state. I was able to fix most of the bugs by playing around with different key combinations and just looking at the text output. I eventually added graphical content, but intentionally kept it crappy. I resisted the urge to create attractive assets since they would be replaced with the No Comply sprites anyway. Neglecting the aesthetics was a challenge—if you cringe at the graphics, I succeeded. Okay, still want to play it? I omitted collision detection and some simple game logic from the prototype, but I believe it demonstrates we can create a structure good enough for a fighting game for Gladius. Today I’ll be switching gears and starting to hack on Gladius to get COLLADA importing working which we’ll discuss in a Paladin meeting early next week.